Want to live chemical free? Try Doctor Bacfarc’s Dark Matter Diet™! ELEEMOSYNARY, WEST VIRGINIA — In the modern era, it seems chemicals are ubiquitous: in our air, water, even in the food we eat. That problem has many consumers worried, prompting people to take an active part in looking at what they are exposed to on a daily basis. 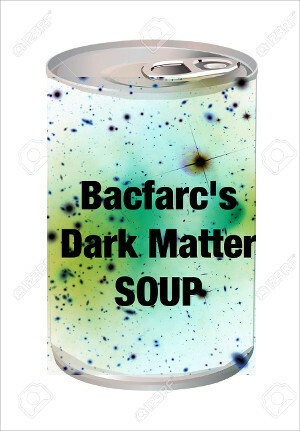 Bacfarc’s Dark Matter Soup™. Try it today! Hari’s activism led the fast-food chain Subway to remove a common chemical used to condition its bread dough, and similarly has pushed unsuccessfully for boycotts on the popular Starbucks pumpkin spice latte. But Bacfarc doesn’t think Hari goes far enough. And that led Bacfarc back to his earlier research during his time at the University of Northern South Carolina (home of the Fighting Goliath Groupers). During the three years he taught there, he developed an entire theory of everything — which notably includes dark matter. While his research was interrupted for two years while he camped out in front of the offices of Physical Review Letters to convince them to publish his papers, he picked it up again recently. “Famously, dark matter does not contain any chemicals at all,” he notes. The University of Northern West Virginia is located in beautiful Eleemosynary, just north of Wheeling. Contact us for a brochure!